With a total of 17 stalls and 3 mini restaurants among its tenant mix, Food Republic at Causeway Point serves up a variety of local food delights as well as restraint style Korean food at affordable prices. 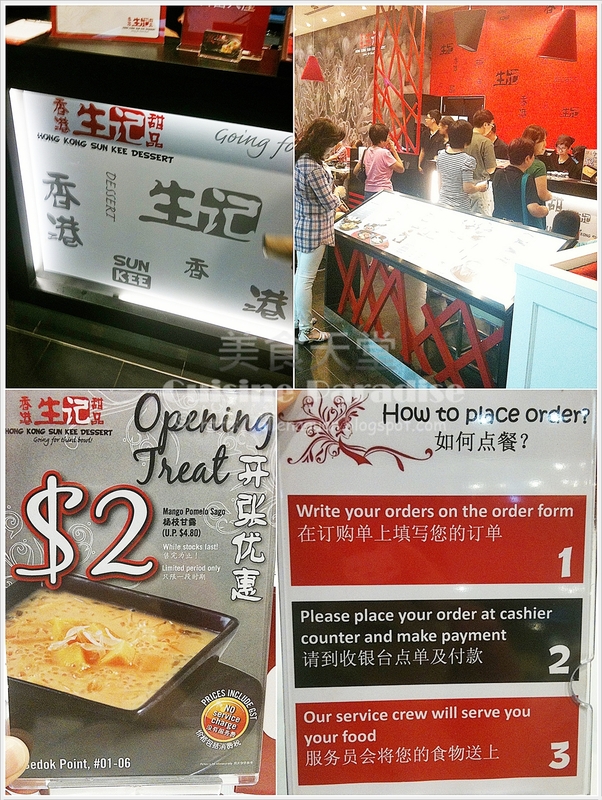 In August 2012, Food Republic has opened it 9th outlet at level 4 of the newly revamp Causeway Point Shopping Mall which brings in new dining concept as compared to the previous food mall. 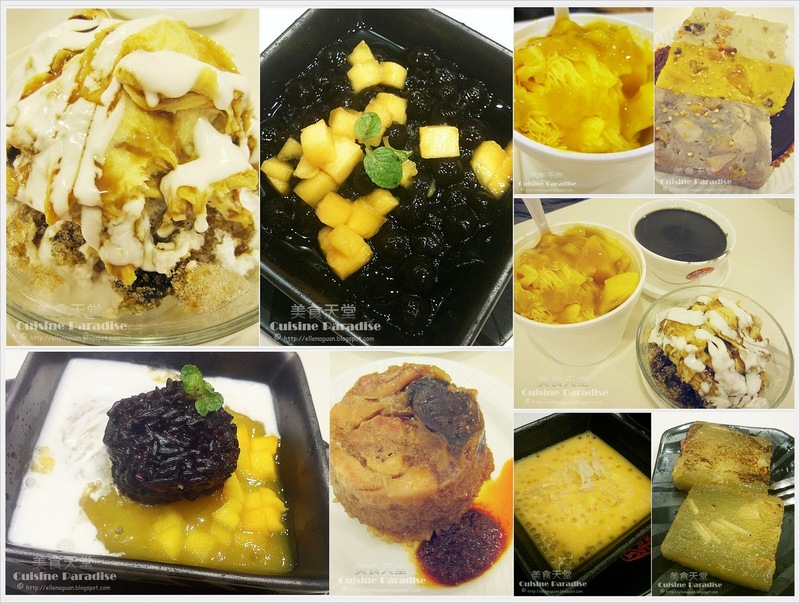 Below are some of the stalls that we have tired during the media tasting which is organised by Food Republic, Causeway Point. "I love Yoo!" has an very unique Chinese name call 老油鬼鬼 which translate as "Lao You Gui Gui". Although causeway point outlet is their first branch in Singapore, but I love Yoo! has been serving well-loved traditional Malaysian dishes and snacks in Malaysia since 2007. Above are some of their signature items such as You Tiao - 油条 (S$0.90 each) and Mix Bun - 夹粽 (S$1.00 each). This is my first time trying mix bun and I love the combination of the fragrant bun skin that surrounds the chewy mochi like dough in the center of the bun. On the other hand, they also have freshly made Sesame Balls with assorted fillings such as:- red bean, lotus and peanuts at S$1.10 each.. To enhance the taste of these traditional snacks, I would recommend you to order a cup of their fresh soya bean milk which freshly made daily. For a more filling breakfast or brunch, grab a bowl of their Dried Oyster Peanuts or Dried Scallop porridge together with their freshly made You Tiao would definitely satisfy your craving too . When this dark sauce hor fun arrived at our table, the first thought that comes to my mind is the Crayfish Hor Fun from Hong Lim Food Complex which I love when I used to work around that area. Above is the Signature Prawn and Chicken Ipoh Ho Fun (S$$4.80) from Funan Weng that served with their specially brewed herbal dark soy sauce, ultra-smooth ho fun and fresh tiger prawns as well as tender chicken meat. If you love prawn dumplings, remember to order a bowl of their Gourmet Dumpling Soup (S$5.50) where the dumplings are made with fresh pork and shrimps to retain it's freshness and taste. For a non fish ball fan, I always avoid ordering fish balls noodle whenever I could but after trying Li Xin's Fish Balls Noodle (S$4.00), it actually changed my mind set on this. I love the springy noodles which coated evenly with their special homemade chili sauce as well as the crispy lard that perfect the taste of this simple dried noodles. According to the Li Xin's boss, their fish balls are made twice daily using superior yellowtail fish and kept chilled in cold water rather in the freezer. Most of us loves their Fish Ball Soup (S$4.00) which comes in a bowl of 8 bouncy fish balls that soak in tasty soup broth. I have tried this Dao Xiao Mian (Knife Shaved Noodles) once at Food Republic (VivoCity) and it does not taste as good as the one over at Causeway Point outlet as the noodle were rather overcooked. Just to share for those who had not tried Dao Xiao Mian (Knife Shaved Noodles) before, the one shown above is their Stewed Beef With Noodle Soup (S$6.00). If you like herbal broth base with handmade noodles and beef, perhaps you would like to give this a go. Padang food is well known for its robust flavours that come from the use of rich coconut milk, chilli and aromatic spices. The folks at Padang Raya are committed to using only natural ingredients to retain it's original taste and health benefits. Ikan Asam Pedas Set (S$5.00) serve with Rice, Ikan Asam Pedas (sour spicy fish) and Cabbage. Curry Ayam Set (S$5.00) on the other hand is serve with Rice, Ayam Curry Drumstick and Long Bean Balacan. Their Ayam Curry is fragrant and not too over-power with the spices and coconut milk taste. And the Long Bean Balacan is just nice with at crunchy texture which I love. Shami Banana Leaf Delights is one of the popular food stall in Northpoint Shopping Centre since 1993. I still remember during my secondary school days, a group of us would always order their Chicken Briyani which was only S$5.00 pet set. Now with another two additional outlets at Sembawang Road and Food Republic Causeway Point, patrons can easily enjoy their favourite briyani at more convenient locations without joining the crazy queue over at Northpoint. For us, my all time favourite is their Chicken Briyani Set (S$7.00) which I would always ask for more gravy to go with the rice. If you don't fancy chicken you could also choose from other optional such as Boneless Mutton Briyani Set (S$8.00), Mutton Briyani, Tandoori Chicken Set or Sambal Fish Set. A few months ago I was catch with Korea fever that watching a few Korean drama which inspired me to cook a few of their local dishes such as Bibimbap, Ginseng Chicken (samgyetang), Korean Rice Cake (Tteokbokki) and etc. Kimchi Soup (S$7.50) served with steamed rice is perfect for raining day or when you crave for something spicy and yet light from the usual meaty soup. Bibimhap (S$7.50) which is also known as Hot Stone Pot Rice comes in either chicken / pork / beef that you could choose from. The bibimhap sauce is served separately with kimichi as banchan (side dishes) so that you could add the amount of sauce into your rice according to your preference. Andong Jjimdak Set (S$11.90) also known as Andong Steamed Chicken is serve together with steamed rice. This Korean style steamed chicken consists of spinach, carrot, potato, chicken and glass noodle which is a prefer one dish meal with meat and vegetable all in one. Bulgogi Salad (S$8.50) is something light for weigh watcher who still want to have some bits on meat other than rice or noodles. I love the refreshing dressing and the bulgogi indeed added some bite and taste to the salad. Most of my friends told me that when ordering dessert at Food Republic, Chendol (S$2.80) is a "must try" on the list as they have quiet a good reputation on serving decent Chendol that you would fall in love with. Overall the coconut base is just smoothing without overpowering the taste of the red beans and gula melaka and indeed it's something nice to have after a hearty meal. We are surprised and delighted to find an ice cream counter over at Caffe Republic where they offer warm Belgium waffles with a choice of 18 different flavour of Gelato Ice Cream such as chocolate, cookie and cream, strawberry, green tea and etc. Personally I love their Chocolate and Green Tea Gelato which is taste quiet decent as compared to those branded Gelato stalls. Another key point of Caffe Republic is their style mod cafe showcasing popular Western coffees such as Cafe Latte, Cappuccino, Espresso and etc which you could get a cup to perk up your day with some snacks or after meal drinks. Below are another 2 stalls that my family and I tried on during another visit to Food Republic, Causeway Point. My boy loves the Chicken Rice from Sergeant Hainanese Chicken Rice. Their rice is infused with lemongrass fragrant and it's not greasy as compared to some other stalls. 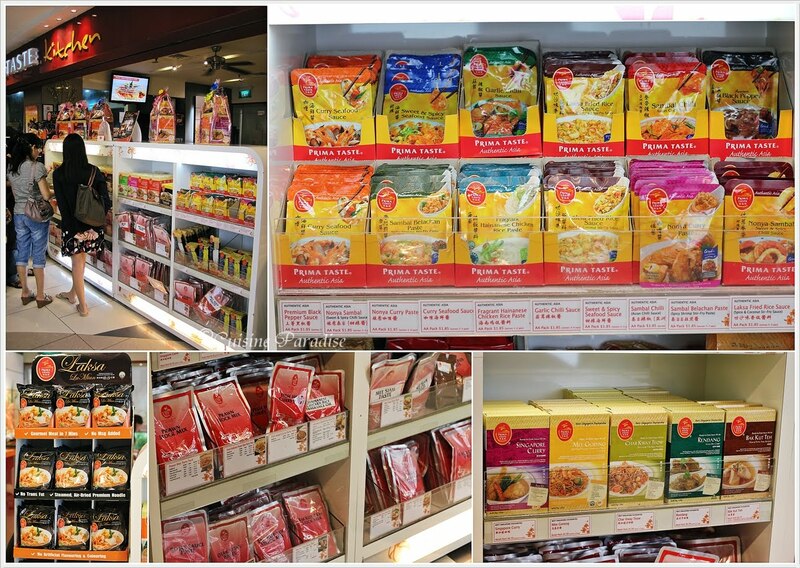 They have quiet a range of items to choose from such as Steamed Chicken, Roasted Chicken, Chicken Cutlets, Curry Noodle, Thai Sauce Tofu and etc. As a herbal soup lover, my attention was draw to this Granny Fine Soups during our tasting at Food Republic. Although the price might be slightly higher as compared to other herbal soup stalls but I still decide to try this Double-boiled Black Chicken With Cordyceps Flower which is around S$8.00 per serving. The soup taste quiet decent, but for personal preference I would prefer more herbal taste which would be better. Apart from the chicken rice and herbal soup we also tried the combo set from Funan Weng Ipoh Hor Fun Express mentioned above and overall it still taste great as compared to what we had during media tasting. Lastly I would like to thank Food Republic and Touch Communications for the invite media tasting. Prima Taste Kitchen is a quick-service restaurant which located in Centrepoint Mall, Orchard. They serves a selection of authentic Singapore favourites such as Bak Kut Teh, Laksa, Hainanese Chicken Rice and Singapore Curry Chicken. The restaurant features a modern ambiance accented and diners can also enjoy 'live' cooking demonstrations through their showcase kitchen. For beverage we are recommended to try their Calamansi Juice and Lychee Sensation where they used preserved sour plum in the drinks to create a unique flavour. Love their Lychee Sensation which is fizzy 7-up drinks with a few seeds of canned syrup lychee and preserved sour plum. First to serve is this all-time favourite local snack known as Vegetable Popiah which is richly stuffed with egg slices, turnip, vegetables, shrimp, minced pork, mushroom and etc. The crisp and refreshing sensation of the juicy fillings and intense flavour definitely leaves you longing for more. We simply love the taste of this Popiah as the ingredients are well combined without overpower taste of this dish. Rojak is a common local dish/appetiser which could be easily found at most hawker centres or coffee shop stalls. Prima Taste's Rojak is very flavorsome with toasted youtiao, cucumber and fresh fruits without being overpowering by it's prawn paste sauce. On top of the tasty coating sauce, we also love the generous amount of crashed peanut which they used to garish the rojak as it definitely add bonus points to this dish. Chicken Rice is one of the all-time local favourite which you could have it anytime of the day. I still remember vividly during my 3 years overseas stay I would always bring back at least 1/2 a dozen of these Prima Taste, Hainanese Chicken Rice sauce kit to easy our preparation on this dish. Here at Prima Taste Kitchen, their poached chicken is very tender and juicy with a thin layer of jelly-like skin which makes you always wanted to top up for extra portion of meat. The chicken rice is very fragrant and the texture of the rice is just cooked to perfection where is it not too hard or soft too. For the chicken rice set, you could choose from either Hainanese Chicken, Soya Chicken and Crispy Chicken. The chicken curry for that day was a bit too thick on the gravy which makes it taste a bit powdery rather than those smooth and flowing texture. Personally this is not my preference of curry but for those who perfect this type of Hainanese style perhaps you could give it a try. This curry set comes with a bowl of steamed rice but you could also request to change it to chicken rice instead. With Prima Taste Bak Kut Teh Sauce Kit you could also cook a pot of this tasty Teochew Style peppery soup at your own convenience at home. And moreover what you required is just minimum fresh ingredients such prime/pork ribs together with their prepacked stock mix. Love the taste of the soup but it would be even better if more peppercorns are added.The texture of the prime ribs are just nice for our liking as it is not over/under cooked. When we first taste the soup broth from this prawn mee we were kind of surprised that these actually was prepared from their Prawn Mee Sauce Kit (detail HERE). From a glance above you could see the decent amount of ingredients such as sliced pork, fresh prawns, bean sprouts, veggies and flat yellow noodles which is pretty reasonable for it's price. Out of all the main dishes that we have tried, their Fried Hokkien Prawn Noodle has definitely out shine the rest of the dishes and won our heart. I love the wok taste and texture of the noodles which is just nicely cooked and fully adsorb the taste from the prawn broth. According to Vangelynn, the chef actually fried individual order plate by plate in order to maintain the standard of this dish. For your information you could use the Prawn Mee Sauce Kit to cook either Prawn Mee Soup or Fried Hokkien Prawn Noodle. And since I am in love with their Fried Hokkien Prawn Noodle, I have bought a packet of the Sauce Kit from supermarket which I am going to try cooking it at home soon. The gravy of Prima Taste Laksa is smooth and rich which is prepared from its pre-packed laksa spice. In this way you could easily prepared your favourite laksa without much trouble on grinding your own laksa paste and enjoy a bowl of decent laksa anytime of the day. Apart from the above Authentic Laksa Spice Kit, Prima Taste also has another "Singapore Laksa La Mian" which you could easily purchase from their outlet or local supermarkets. You could read more about my review on this product HERE at my recipe blog. Vangelynn mentioned that this Glass Jelly with Longan in Gula Melaka is a new dessert on their menu. And for a light and refreshing dessert with hint of gula melaka syrup to sweeten the taste, I am sure this would come in perfect as dessert after a hearty meal. Their Chendol dessert consist of rich coconut milk, a worm-like green jelly made from rice flour, red beans and etc served together with shaved ice and fragrance Gula Melaka(palm sugar). Although the taste is great but however we find that the shaved ice was rather rough which could have being better if it is much smoother and fine texture. For a lighter and smaller portion of dessert, you could order this Longan with Almond Beancurd. 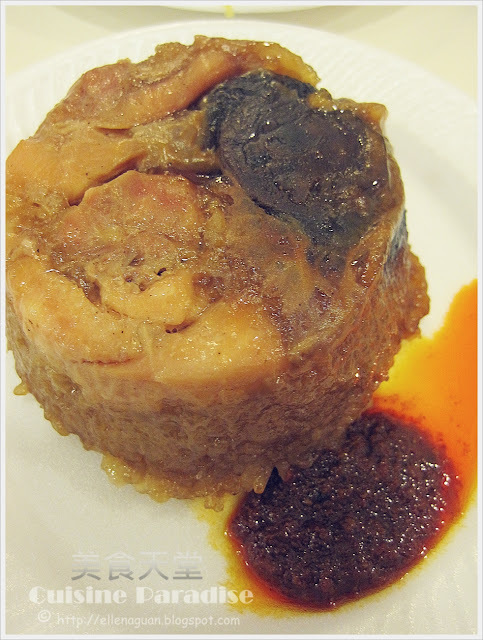 The beancurd is very smooth and silky with hint of almond flavour that does not overpower the taste of the whole dessert. If you are looking for some tea-time snack during your festive shopping trip around Orchard area on weekday, perhaps Prima Taste Kitchen tea-time special would have something "local" that you prefer. For twin sharing you might consider to get their "2 dishes + 1 drink" @ S$4.50 which I think it's just nice to fill up your tummy before the next meal. Apart from serving array of local dishes at Prima Taste Kitchen, they also have a corner selling different varieties of their cooking sauce ranging from:- Singapore favourites Sauce Kit whereby you could whip up local dishes such as prawn mee, char kway teow, mee sim and etc to Authentic Asian Sauce such as garlic chilli sauce, Sambal Belachan Paste, Premium Black Pepper Sauce and etc to prepare authentic Asian dishes at home. For your conveniences, you could also order these sauce kits via their website HERE or through any supermarkets in Singapore. And for those regular or big users you might wish to save considerably through their party packs which only available in certain popular products such as Bak Chor Mee and Lor Mee. Cooking instructions can be easily found on the packaging and online plus they also have cooking classes for those who intend to pick up some cooking skill using their ready paste and products. You could register for their Cooking Workshops at a reasonable fees(S$20.00) via their website HERE. Lastly I would like to thank Vangelynn and Prima Taste for the invited tasting. 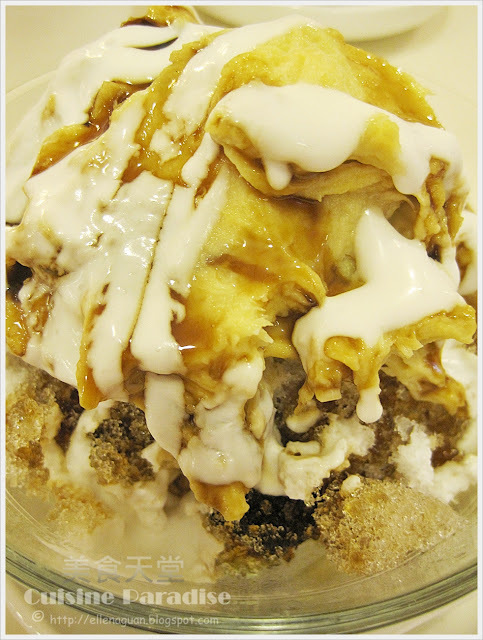 Recently with a few newly renovated shopping malls and the new launched of NEX and Bedok Point around matured HDB area it seems that you can easily spot one or two Asian dessert stall in any of the malls. For instant the new "Hong Kong Sun Kee Dessert" has already set their foot on NEX and Bedok Point to capture the hearts of the patrons with their unique Desserts and Wanton Noodles. Upon Opening Promotion Sun Kee is having a great S$2.00 deal for the well-known "Mango Pomelo Sago - 杨枝甘露" dessert at their NEX and Bedok Point outlets. So if you are a fan of Mango Pomelo you must not missed out their special promotion that is valid for both dine-in and take away in these two specify outlets. Since last week we are at the newly open Bedok Point we decided to drop by Sun Kee and try out some of their desserts which I have read some good feedback on. 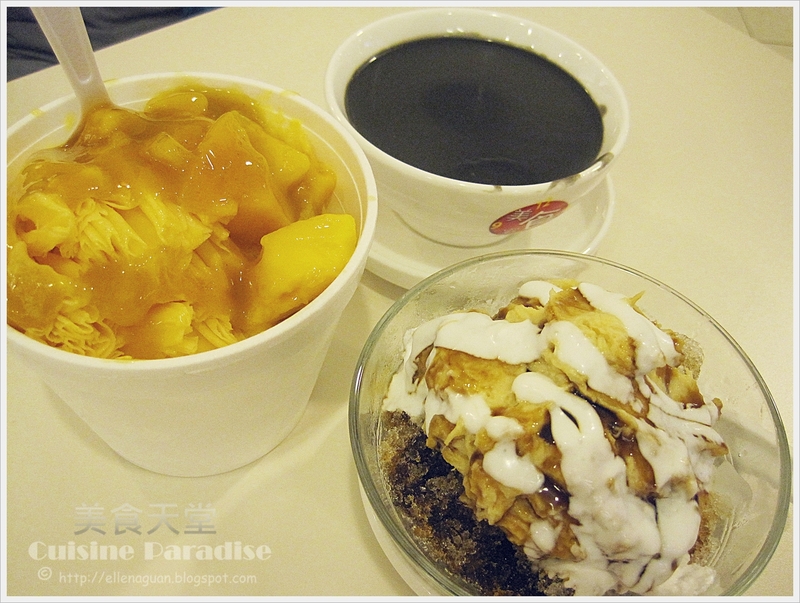 The first dessert to serve is "Lemongrass Jelly with Mango and Black Pearls - 柠檬草王子". The lemongrass jelly is very smooth till can be wobble down your throat leaving a light lemongrass scent. In the bowl you could also find generous amount of chewy black pearl and fresh mango cubes that makes different texture and taste. I am sure most of you have eaten black glutinous rice with coconut milk (Pulut Hitam) which is a common dessert found in Singapore. 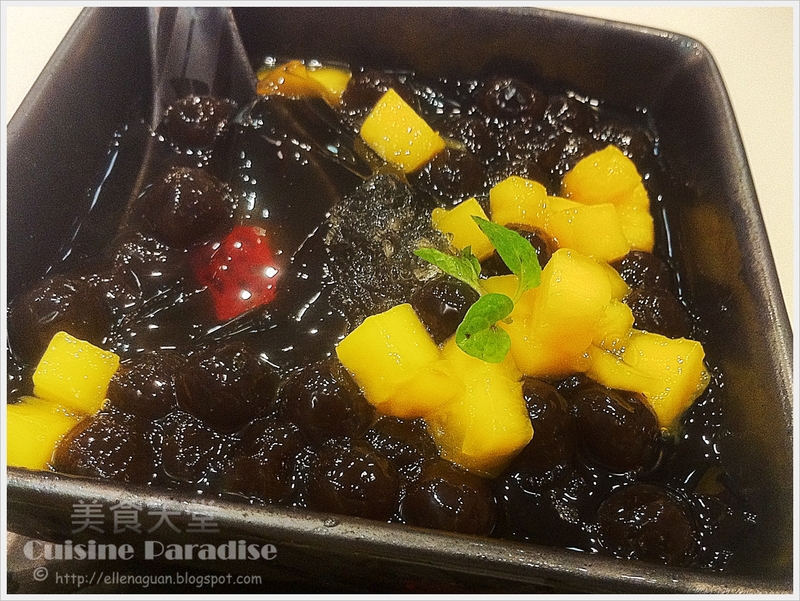 But this "Black Glutinous Rice Ball on Coconut Milk and Mango Puree - 芒椰糯米球" found in HK Sun Kee is rather different. The black glutinous rice ball is sitting on top of the mango ice together with cubes of fresh mango and good amount of coconut milk to enhance the taste. Overall this is quite an interesting combination but we feel that the glutinous rice ball was kind of too dry and the grains is more on the hard texture side rather than soft and sticky. This is their S$2.00 promotion item known as "Mango Pomelo Sago - 杨枝甘露". The combination of mango puree with small sago pearl goes well with the juicy pomelo topping which makes this a great tropical dessert during hot days or after meal. 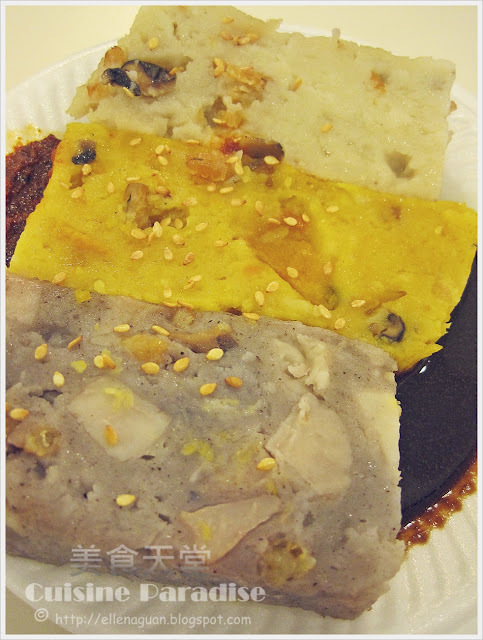 As for snack we are caught between the choice from Osmanthus Jelly, Custard Bun and this "Water Chestnut Cake - 马蹄糕". But guess we finally settle for this pan-fried water chestnut cake which taste great with its slightly burnt and crispy outer texture. Last month Dessert Story has opened a new outlet at North Point, Yishun where patrons can either dine-in at the store area or takeaway the orders. So with its' attractive menu and clean layout concept we decided to pop-by and try out some of their dessert after our Sunday service last weekend. After making our orders we are very surprised and kind of disappointed with the presentation of their food. With the price that we are paying for, it seems that most of the food and desserts are being served on those party type of white paper plate and bowl which makes it look so unprofessional. 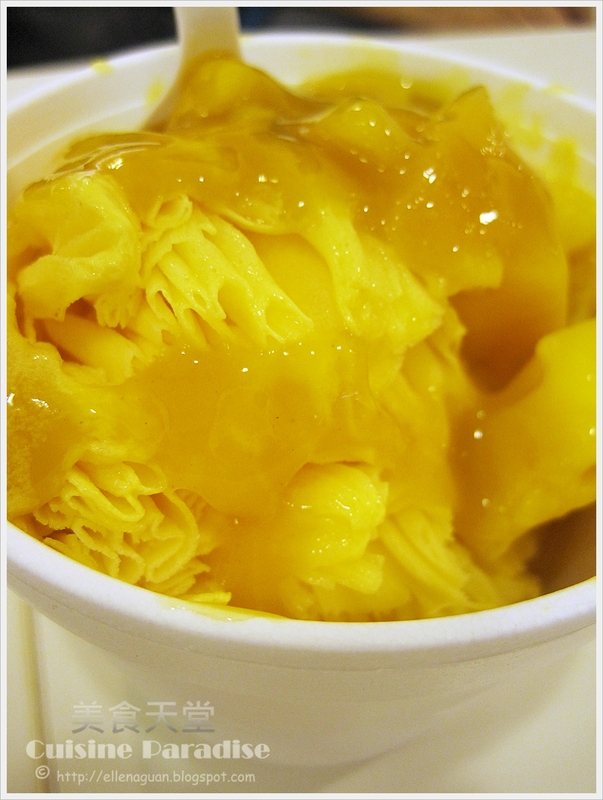 And for this "Mango Snow Ice - 芒果冰", the colour of the mango look rather brown instead of those bright yellow. Overall the mango taste rather sourish instead of sweet which makes this dessert a disappointment in taste. But at least their "Durian Pengat" taste quite decent with a scoop of pure durian paste sitting on top of the shaved ice and drizzle with generous amount of coconut cream and Gula Melaka syrup (Palm Sweet Syrup). I was attracted to this "Triple Colour Steamed Cake" when placing the order. According to the cashier staff each colour represents a different ingredients such as "Purple - Yam Cake". "Orange - Pumpkin Cake" and "White - Carrot Cake". After tasting we find that there are actually nothing fancy about these steamed cakes or its' sweet sauce but except for the accompany dried chili sauce which was spicy, fragrant and it did extra some points to this snack. Since the varieties of dim sum at this outlet was limited we do not have other choices but to pick this "Steam Glutinous Rice". But at least the glutinous rice was well seasoned and the overall texture of the rice and meat were soft and tender to taste. With more and more dessert outlets sprouting out from each shopping malls I guess patrons like us would have more exposure to all kinds of new creations. But sometime I realised that different outlets seems to be serving different standard of food which it rather bad in reflecting their company imagine. Perhaps in order to maintain a good quality and standard of their food they should not consider to open too many outlets unless they can standardise and guarantee the quality of their servings.